I was under an enormous amount of stress just trying to get pregnant with my daughter, so the last thing I wanted to do was become the crazy pregnant lady. I knew I needed to distract myself from the fact that my life was about to change forever and let me tell you, it didn’t seem easy at first. I was feeling totally inept at being a mum, but I knew all this anxiety wasn’t good for my mind and heart. So I decided to take some steps to change things so I wouldn’t lose my mind during pregnancy before the baby even came. We didn’t have the funds to really go all out, but I did find two dressers at an antique shop that were in great condition and painted them. I found some matching wall decor at my local craft store and a cute cube shelf from Ikea that I turned on its side to utilize for my baby’s books. Keeping my hands busy by finishing a project kept me from constantly grabbing my Doppler to check my baby’s heartbeat. It’s easy, when you’re pregnant, to feel the need to know everything and be as prepared as possible. And while it was responsible of me to do my research on all things pregnancy, I was finding myself overwhelmed at the stuff I didn’t know. So I put down the advice books and the What To Expect books and pulled out some novels — books where I could escape into another world instead of researching one more damn car seat review. 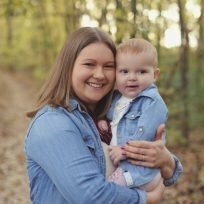 It helped to clear my mind because I knew in order to maintain my sanity through this pregnancy, I needed to stop thinking about the fact that I was growing a human every so often. Keeping things inside is never good for me because then at the most inopportune it all spills out and that makes it awkward for everyone involved. While I regret not seeing a therapist during that time, I talked a lot with my husband and my friends who had kids. I told them when I was overwhelmed with the baby registry, and the fact that this kid was probably going to come out covered in mozzarella because all my stomach could tolerate was pizza. I remember even having a long discussion with my OB about my intense fear of a stillbirth. I don’t ever regret opening up to people, because it let me spew my issues out instead of simmering inside me along with the pepperoni and mushrooms. Except for those annoyingly frequent trips to the bathroom, of course. I didn’t make plans very far in advance and I learned to be okay when I needed to cancel a lunch date because I just needed a damn nap. And when I couldn’t keep my eyes open anymore at 5:30 P.M., I went to bed for a while, because that’s when my body was telling me to sleep. When we’re growing a baby, we put enormous pressure on ourselves, don’t we? I expected when I first got pregnant, that I would be eating a variety of healthy foods for my growing bundle of joy, but thanks to intense nausea and general barfyness, all I could manage most days was eating out of my quart-sized bag of goldfish crackers that I carried around with me. I needed to get certain things done at certain times in my trimesters according to the pregnancy books (see point number two), but I learned I had to let that go and trust the things would eventually get done without my rigid scheduling. I focused on one day at a time, because looking ahead at the next week or month got to be too much. In doing these things, it started to become easier to live in the moment and enjoy the good parts of pregnancy. It’s a small part of the parenthood journey and it went by fast.